107 Saturday September 18th 1875. We were busy all the forenoon. As soon as we got the work done after dinner Hatt and I went over to town in the buggy We had hardly got through the marketing when it began to rain We got wet coming home I helped with the evening work. Winnie stayed here all night. 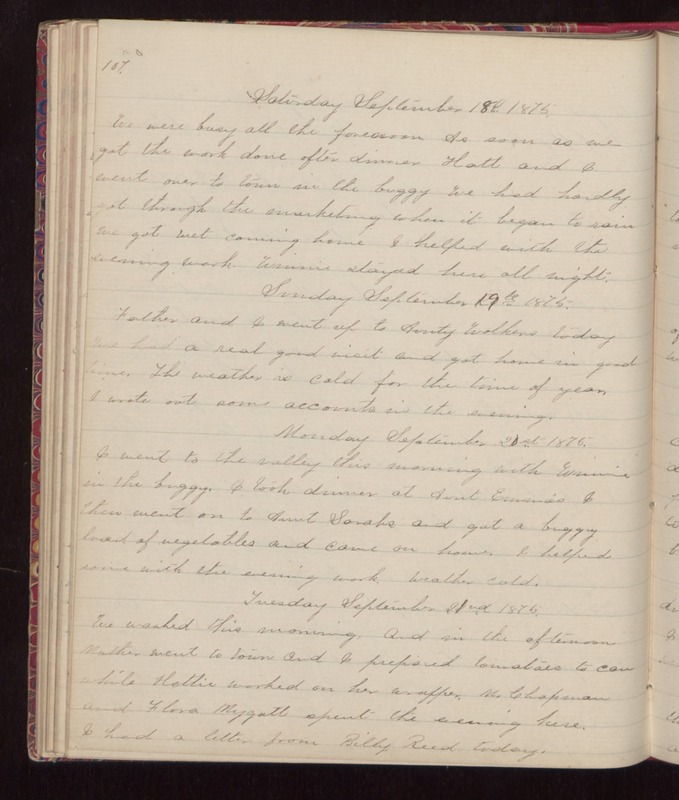 Sunday September 19th 1875. Father and I went up to Aunty Walkers today We had a real good visit and got home in good time. The weather is cold for the time of year. I wrote out some accounts in the evening. Monday September 20th 1875. I went to the valley this morning with Winnie in the buggy. I took dinner at Aunt Emmas I then went on to Aunt Sarahs and got a buggy load of vegetables and came on home. I helped some with the evening work. Weather cold. Tuesday September 21nd 1875. We washed this morning. And in the afternoon Mother went to town and I prepared tomatoes to can while Hattie worked on her wrapper. Mr Chapman and Flora Mygatt spent the evening here. I had a letter from Billy Reed today.